On a small planet in a large solar system on the far side of the galaxy, there is intelligent life. The dominant life form is the Geek, not to be confused with the geeks we know here on earth. Geeks have extremely high IQ's, but they lack common sense. (OK, so there is some resemblance to earthly geeks.) A Geek could out-perform any scientific calculator without blinking an eye, but would have trouble solving even simple puzzles. Zeek is a typical Geek. He has a large head with a very large brain, and he can solve complex mathematical formulas in a flash. But, he is easily confused by everyday challenges. Unfortunately, this is quite a problem where Zeek lives. Everyday challenges can be fatal if he makes a mistake, and he needs help deciding how to get around. This is where you come in. You can help him get to the mushrooms that he and his family like so much. The primary goal of each level is to guide Zeek to a mushroom. It is the favorite food of the Geeks, and Zeek must gather them for his family. Along the way, you will collect points for flowers that Zeek picks, for gates that he opens, for finding a treasure chest, and for matching up magic crystals. You will also collect bonus points for completing a level quickly. The faster you can get through the level, the more bonus points you collect. Thus, to maximize your score, you must move Zeek quickly to the mushroom, and collect the extra treasures along the way. You can control Zeek's movement with the arrow keys on the keyboard or with the mouse. Press an arrow key for the direction that you want Zeek to move, and he will respond as long as you hold the key down. Using the mouse, just click on the spot that you want Zeek to move to, and he responds. However, Zeek may not move exactly the way you wish unless you click on a spot that is a horizontal or vertical move for him. If Zeek has a fatal encounter with one of the local hazards, or if he is otherwise trapped in a hopeless situation, you can restart the same level by pressing the "Esc" key on the keyboard or by clicking the mouse on the Zeek button on the scorepad. After restarting a level with a new Zeek, no score will accumulate until you have once again collected the same (or equivalent) treasures that you collected on the previous attempt at the level. You can save or restore a game in progress, load a puzzle pack (in part two), skip a level, exit the game, or perform any of several other functions by selecting the Disk Functions button on the scorepad. Also, you can view the high scores at any time by selecting the Star Performers button. Zeek the Geek Part One is an introduction to Zeek and the puzzling situations that he finds himself in. Zeek needs to collect mushrooms for his family, and you can help him figure out how to get them. You will guide him through fifteen levels of play, and encounter a number of obstacles along the way. There are block walls that can't be moved and locked gates that can only be opened if you find the key. There are boulders to push out of the way, flowers that eat Geeks, and many other things that may help or hinder Zeek in getting to the mushrooms. You will have to figure out how to use or avoid the things you find while you guide Zeek on his way. Walls that do not move. Yellow barrels that do not move. Mushrooms that Zeek collects for his family. Toadstools that are fatal if eaten. Round yellow boulders that Zeek can push. Giant apples that Zeek can push. Yellow flowers that Zeek can pick. Purple flower buds that open when a Geek is near. Purple flowers that eat apples and nearby Geeks. Magic crystals that disintegrate when brought together. Dynamite that Zeek can push to destroy most obstacles. Although other members of the Zeek family of programs must be purchased, Zeek the Geek Part One is provided free of charge, and it may be freely copied and distributed. You are encouraged to pass copies along to your friends, to share it at work or at school, and to upload a copy to your favorite bulletin board or internet site. The only restrictions to such distribution are that all files must be included in their original unmodified form, and that no profit shall be made from the distribution (other than a nominal disk copying charge). Zeek the Geek Part Two is a continuation of the adventures of Zeek with thirty all new puzzling situations for you to help Zeek through. Zeek still needs to collect mushrooms for his family, he will meet all the same hazards that he found in Zeek the Geek Part One, and he will meet many new ones, including the Piclasops and Atomic Eyes. A Piclasop looks something like an earthly tyrannosaur, but it is strictly vegetarian. It can inflict a fatal byte if you get in its way, but it ignores Geeks when left alone. Atomic Eyes were placed on Zeek's planet by an alien race that is trying to eliminate the Geeks and eventually take over the planet. They watch the Geeks, and zap them with a laser blast if they can get a clear shot at them. Everything encountered in Part One. Piclasops that graze on the local vegetation. Atomic Eyes that zap Geeks when they can. Blue flowers that are fatal if picked. Attitude Eggs that change the colors of flowers. Rotten Apples that are digested slowly by the purple flowers. Invisibility pills that last for a short time. Zeek the Geek Part Two also includes the ability to read in Zeek the Geek Puzzle Packs. 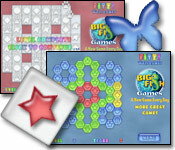 Each Puzzle Pack contains many more puzzles and challenges for you to help Zeek with. Zeek the Geek Puzzle Packs provide an inexpensive way for you to continue the fun of Zeek the Geek Part Two by adding new puzzles for Zeek to solve. The Puzzle Packs currently offered by Sidewalk Software each contain a collection of all new puzzles which can be read into Zeek the Geek Part Two. Once loaded, the Puzzle Pack becomes a whole new game. Choose a simple Puzzle Pack if you don't want to think too hard, or choose a more difficult Puzzle Pack if you really want to be challenged. A number of Zeek the Geek Puzzle Packs are available from Sidewalk Software, and you may be able to find third party puzzle packs available elsewhere. Zeek the Geek Puzzle Pack One, "Nice 'n Easy"
30 puzzles for those who want to be lightly challenged. Zeek the Geek Puzzle Pack Two, "Challenge Pack"
30 very challenging puzzles for the experienced player. Zeek the Geek Puzzle Pack Three, "Puzzles Galore"
60 puzzles, easy to difficult, but most somewhere between. Zeek the Geek Puzzle Pack Four, "Challenge Pack II"
Zeek the Geek Puzzle Pack Five, "Kid's Stuff"
30 very simple puzzles designed for the very young. Zeek the Geek Designer is a user friendly tool that lets you design and save your own puzzle packs for use with Zeek the Geek Part Two. 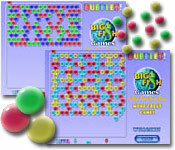 It provides point-and-click building of up to sixty levels of play, and immediate testing of each level. No programming experience is necessary or even helpful in creating your puzzles, and you should be able to learn to use the simple controls in just a few minutes. You can build your puzzles with all the features and functionality of Zeek the Geek Part Two, and you can save your work in a puzzle pack that can be played on Zeek the Geek Part Two. 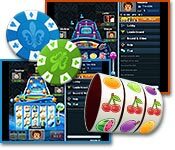 Then you can use, sell, or otherwise distribute your puzzle pack without paying royalty fees to Sidewalk Software. Additionally, Sidewalk Software will offer to sell high quality puzzle packs for you and pay you royalties for each copy sold. This package includes the latest versions of Zeek the Geek Part One, Zeek the Geek Part Two, Zeek the Geek Puzzle Pack One, and Zeek the Geek Puzzle Pack Two. That's a total of 105 puzzles and a great value! This package includes everything in Zeek the Geek Combination One plus Zeek the Geek Puzzle Pack Three and Zeek the Geek Designer. That's a total of 165 puzzles, plus the ability to create more puzzles of your own! All members of the Zeek the Geek family of products are copyrighted by Sidewalk Software. Permission is granted to copy and distribute only Zeek the Geek Part One, and that distribution is subject to the restrictions stated above. For other members of the Zeek the Geek family of products, permission is granted only for the original purchaser to make backup or hard disk copies for his/her own use. Otherwise, the products may not be copied or distributed in any form without the express written permission of Sidewalk Software. Unauthorized reproduction or distribution of these products may result in severe civil or criminal penalties and will be prosecuted to the fullest extent of the law. A sound card with a Windows driver is required for the music and sound effects. Without a sound card, the game has no music, and it has very limited sound effects.